The University of Wisconsin men's hockey team continues Big Ten play on the road at Michigan State. BADGERS GOAL: Corbin McGuire puts the Badgers ahead 3-2 with 8:55 left in the third. Wisconsin takes a 3-2 lead with 8:55 to go in the third. Check that, Cameron Hughes made the redirection in the right circle to lift the puck over Lethemon. 3-2 UW. UW heads back to the power play with 6:28 left in regulation. They lead 3-2. 4 minutes left, with UW holding a 3-2 lead over MSU. Teams are back to even strength with four minutes to play in the third. 2:23 to go in the 3rd, 3-2 Wisconsin. 2:23 to play in the game with the Badgers leading 3-2. MSU leads in shots on goal 28-25. Down to 1:47 left. UW leads MSU 3-2. Brennan Sanford ties it with 1:07 to play in the 3rd! SPARTANS GOAL: With 1:07 left and an extra attacker on, Brennan Sanford scores from right in front, all alone. 3-3. Spartans pull their goalie with 1:20 to go. Michigan State ties it up with 1:07 to go. That does it for regulation, for the fifth time this season well go to OT. END 3: Wisconsin and Michigan State are tied 3-3. Badgers head to overtime for the third time in the last six games. Wisconsin wins it in OT, 4-3. MSU dominating the first 1:10 of overtime but Jurusik is standing tall. BADGERS GOAL: Jake Linhart scores in overtime and No. 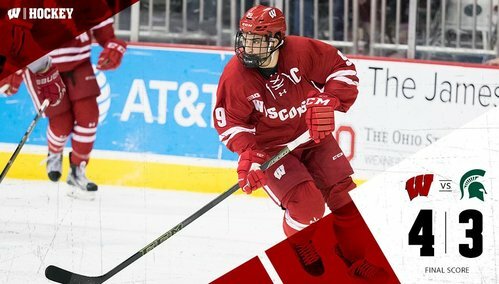 18 Wisconsin beats Michigan State 4-3. The Spartans will face Michigan next weekend - Friday at the Joe and Saturday in Ann Arbor. #Badgers win when trailing after two periods for the first time in 51 games (1-44-6). Last: 2014 @B1GHockey title game vs. Ohio State. And the #Badgers earn their first 4-game season sweep of a @B1GHockey opponent. GAME WINNER! Jake Linhart wins it for @BadgerMHockey in overtime! The win tonight marks the Badgers' first back-to-back road sweeps since Jan. 4-12, 2013 against Alabama Huntsville and Alaska Anchorage. 15 victories through 24 games is the most for @BadgerMHockey since 2005-06. I tweeted earlier that the Badgers got their first 4-game season sweep of a Big Ten opponent. Meant to say first since 2013-14, Penn State. We understand if you don't have any nails after this one. Thankfully Jake Linhart won this one in overtime.